Another flower from Hub’s garden! Or at least, my interpretation, with my Cotman travel palette, in my art journal. He grows some cosmos flowers that have petals that look like little pitchers and some that have flat petals. He brought me a little vase in that incorporated both. I enjoyed inking these quickly and adding some color last night. Above is mostly from the side and back of the flowers, and below, from the front. Some were just beginning to open. 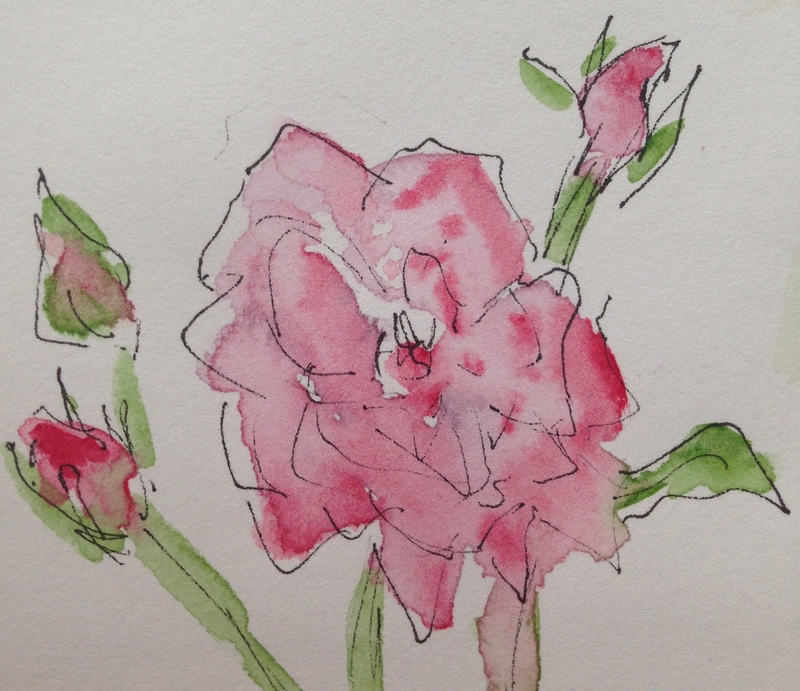 If the watercolor gods are smiling, I might have a cool watercolor rose interpretation featuring a fellow blogger’s photograph for tomorrow. If the gods have turned their backs, I might just have a colored pencil one – or something else entirely instead! Happy Friday to all! Aw thanks Janette! I appreciate that very much! How wonderful to have your painting subjects right out in the garden. 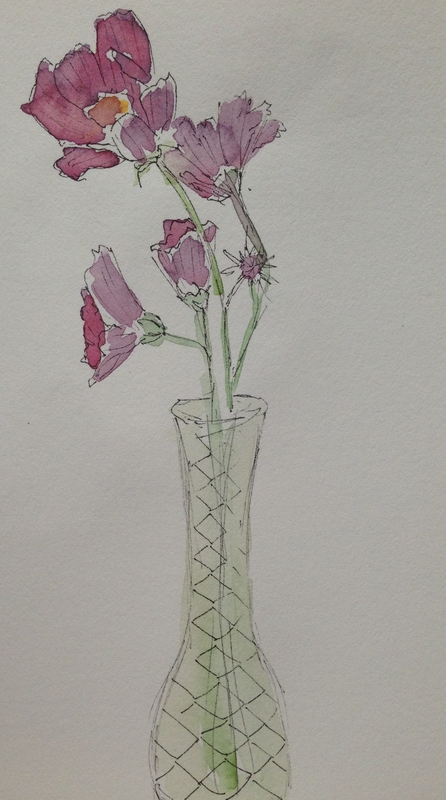 Delightful sketches today, watercolor is so pleasing to the eye. 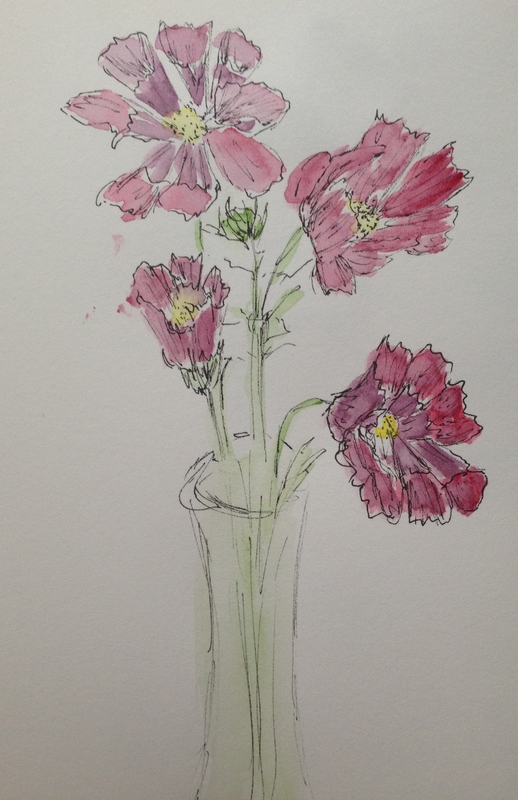 Laura I’m really drawn to your ink and watercolor flowers – these cosmos paintings today are wonderful. I love the loose style you exhibit with the ink, something very freeing about not being so exact. Wonderful rose – my favorite of fresh roses is when they start to die and the reds turn into a deep purplish/magenta hue – wow nothing like it. Enjoyed your post! Have a lovely weekend. Do you do the lines in pencil or ink? Also, I can’t remember if you told us, but do you do a general color form first and then draw in the lines or do you do the lines first and then paint? Either way, they’re really lovely! I’m so glad you like them, Teresa! I find that if I try to do pencil first, the whole thing usually gets squashed because I wind up thinking too much. I tend to be impatient too, so … yeah. So I go right in with ink, just trying to get the essence down, and then I add the color after. That’s cool…it gives it a nice loose feel! Yes, they should, and you do it well! LOL, I’m so glad, Jill! 😀 The horses usually like to eat anything that grows over the fence, but Vic now grows these around one of the bird feeders too so we’re assured of getting a few lol. Thanks for asking, Laura, you´re so cute!!! 💕 Yes, it´s all going well, thank heaven! And I´ll have time to paint. I´ll probably just be able to post a wip of it, but who cares… 😊 Wishing you a wonderful Sunday! Here it´s raining, I´m so glad! Yay for rain! Rainy Sundays are great! Have fun, Ann! Laura, I know the watercolor gods are smiling on you! Looking forward to more flowers. Thank you so much for saying so; you’re too kind! I’ve really been drawn to flowers lately.